Seth Lugo did everything he could to stave off the Mets’ death spiral, but his teammates ran and threw their way to an 8-1 loss. If you missed last night’s game and just saw the score, your first guess would probably be Seth Lugo let the Mets down in his first major league start. After all, he had a 6.93 ERA in 14 AAA starts to open the season. Terry Collins had already turned to Logan Verrett and Jon Niese before going to Lugo out of necessity when Steven Matz was scratched with shoulder soreness. After the team gave up 38 runs on the first four games of their toad trip, Lugo gave the Mets everything they could hope for in the first six innings. He mixed up his 93-94 mph fastball, sinker and offspeed pitches. He moved the ball up and down, pounded the strike zone and didn’t hang any breaking pitches over the middle of the plate. San Francisco has been one of baseball’s most aggressive teams swinging at pitches in the zone; mix in a few double plays and Lugo had thrown six innings of one run ball before he hit the 60-pitch mark. Jose Reyes led off the game with a single to center. Four pitches later, he foreshadowed how Friday night would turn out for the Mets. Johnny Cueto’s pitch was in the dirt. Reyes tried to take second, but he broke late and had no chance to beat the throw. Reyes knew he was out and didn’t even slide. All game long the Mets showed flashes of greatness, only to be dashed when those same players made grievous mistakes. They turned 11 hits into one run. Reyes went 4-for-4 but helped kill the Mets’ biggest rally with another baserunning blunder. James Loney went 2-for-4 and turned a great double play, but he also made multiple defensive miscues that led to three runs. Curtis Granderson hit a home run in to the Bay, but left Asdrubal Cabrera hanging on a fly ball to short center that fell for a double. The Mets only went 1-for-7 with runners in scoring position, but that stat doesn’t stand out amid all the other mistakes. Lugo got the first two outs in the seventh before Eduardo Nunez doubled off the wall in center. Collins could either trust a 26-year-old rookie having the best game of his short big league career or turn to the bullpen. He chose door number two and got a stream of sad trombone music instead of a prize. Joe Panik was intentionally walked. Jerry Blevins came in to face a lefty pinch hitter, but Bruce Bochy turned to switch hitter Ehire Adrianza instead. He and Denard Span both singled to make it a 3-1 game. Hard throwing lefty Josh Smoker finally got a big league appearance, but only retired one of the first three Giants’ hitters to open the eighth. Collins then turned to Jeurys Familia to try and keep the Mets in striking distance. Unfortunately, Familia was wild in the non-save situation, giving up a single and RBI groundout. He got another ground ball to get out of the inning, but Cabrera threw wide and Loney showed his lack of range stretching for grounders. Two runs scored and Erik Goeddel was charged with ending the inning. After four batters and two more runs scoring, Goeddel eventually got his out. By this point the game was over – the Mets bullpen gave up eight hits while only getting four outs. Lugo pitched better than his line score suggests. He was pulled after 69 pitches (including the intentional walk) and had gas left in the tank. 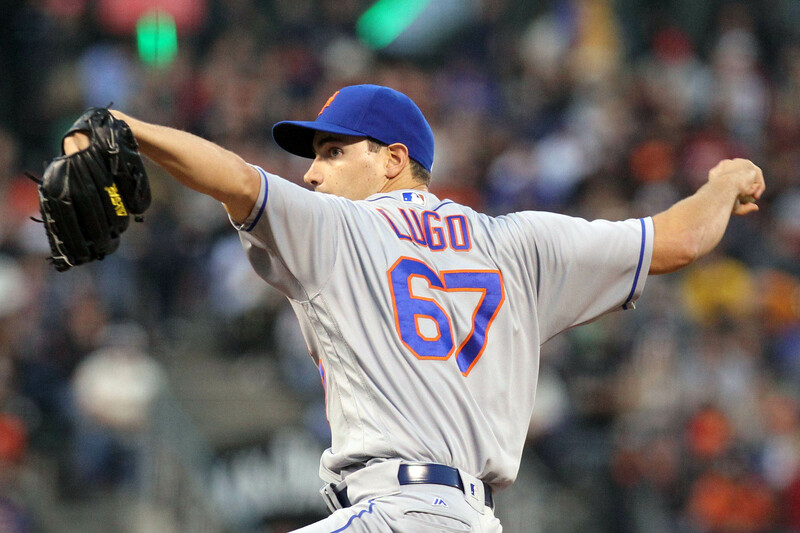 After the struggles of Verrett and Niese, some fans will certainly call for Lugo to get another start. Baseball is full of pitchers who have one great start and never match it – think back to Verrett in Colorado last year. That being said, it would probably be good for the Mets to see what Lugo can do starting a game in a balanced park instead of Las Vegas or San Francisco. The Mets play their only day game of the week. Based on how this trip has gone, New York fans may regret a game that ends before bedtime.